Lionel Messi says it's over. He's retiring from Argentina's national team. After losing three previous Copa America finals, Lionel Messi on Sunday night had another chance to win. 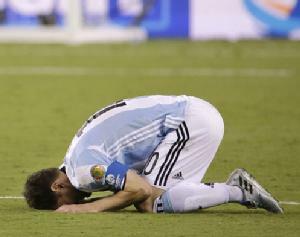 Argentina and Chile were locked in a scoreless tie, and the match would be decided by penalty kicks. Messi bent down to adjust the ball and backed up to get a running start. The five-time FIFA Ballon d'Or winner licked his lip, gave the goalie a quick appraising glance, and sent a cannonball-like shot over the goal, missing for Argentina when it mattered most. In a promo video before the game, Sports Illustrated called Messi the "greatest soccer player ever" and compared him to Muhammad Ali, Babe Ruth and Michael Jordan. He has had a celebrated career with FC Barcelona in Spain. He's famous for breathtaking shots, often taken after a blur of footwork to get past defenders. But aside from an Olympic gold in 2008, Messi has never been able to bring home a major international championship playing for his home country.
" 'It's been four finals, I tried,' added Messi, who made his debut for Argentina in 2005 and has played 113 times for his country.
" 'It's very hard, but the decision is taken. Now I will not try more and there will be no going back.' "